It’s been a whirlwind week for that I just needed some Andrea time to cool off. 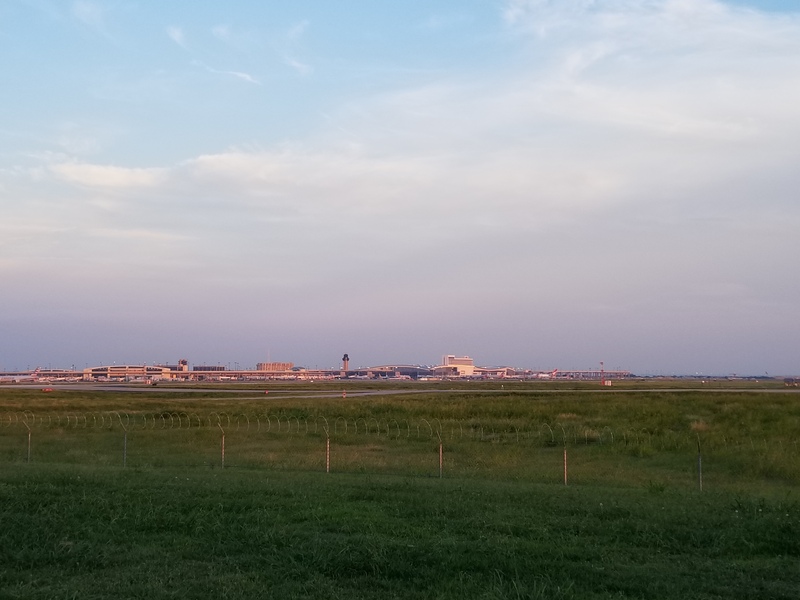 I returned back to Dallas on Saturday after spending a few days in Louisiana celebrating the homegoing of my Aunt Elaine. I love to say I’m a Louisiana native. 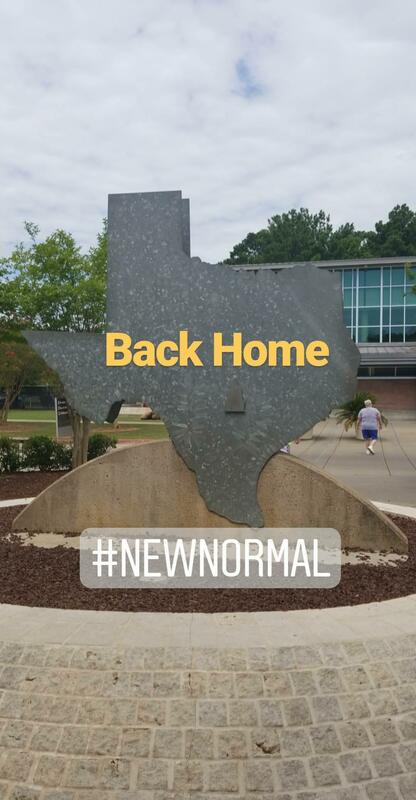 It is forever engrained in me but the new normal is that I’m a Texas resident. There is no way to shake it. I’ve been here for 7 years and honestly I don’t see that changing anytime soon. I spent Saturday catching up to make this week less hectic than it needs to be. Oh Sunday. Wednesdays and Sundays are my favorite days of the week. Wednesdays mean it is almost over and Sunday is my only day of relaxation. Let me tell you how I enjoyed this one. I started the day doing a pre-birthday outing with my sister. We started at Toulouse Cafe and Barin Highland Park. 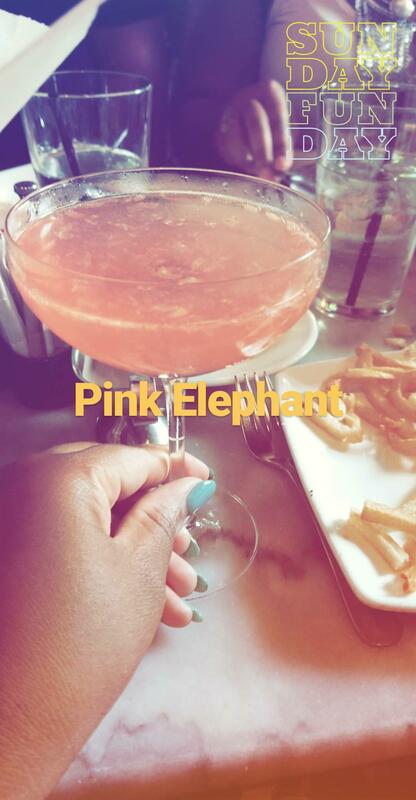 I wasn’t that hungry since I ate at home but their drinks were definitely the right potion for Sunday Funday. 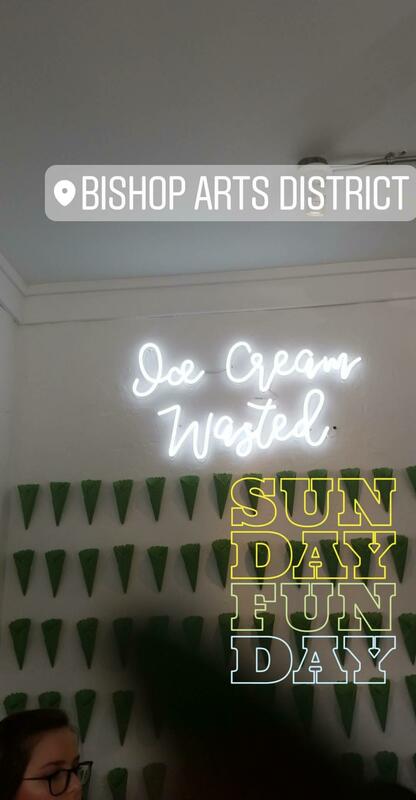 After celebrating with my sister for her 34th birthday, I headed to Bishop Arts for the Grand Opening of Ice Cream Wasted. I can’t give much about the company because most of the ice cream was gone and the kind I tried wasn’t a kind that I’d purchase. I’ll have to try it again when there is a flavor I like available. After they ran out of ice cream at Ice Cream Wasted, I decided to take my talents to a place in Bishop Arts that never disappoints and that is Pink Magnolia. 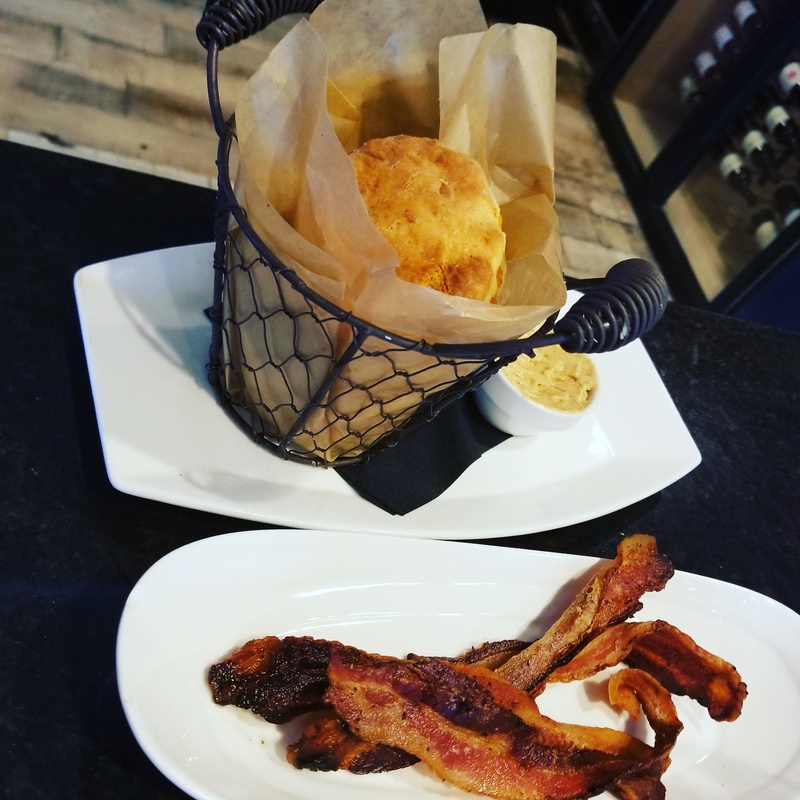 I still wasn’t as hungry but opted for biscuits and bacon because listen…it’s biscuits and bacon. There cinnamon sugar concoction is to die for on those biscuits. Oh yeah and I added more champagne to my diet for yesterday. After leaving Pink Magnolia, I met for friend Treniece for dinner at Zenna Thai in Dallas/Carrollton. Lastly, I ventured to the DFW Founders Plaza because it’s a place that I always wondered where it was and it’s Sunday, why not? That’s all for now. Stay tuned to my next Sunday Funday experience in DFW. 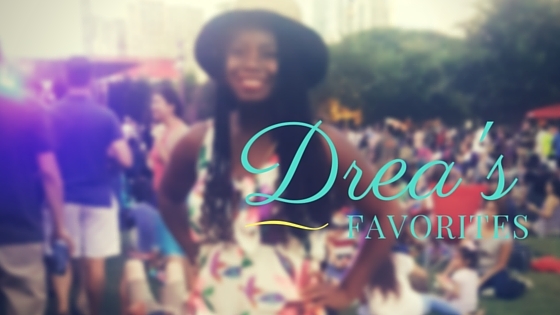 If you’ve been following my blog, you know that I love to share my places in Dallas a lot. I like to eat despite my palate being small and I like to adventure to places. One of my favorite places to go is the American Airlines Center. This includes Mavericks games, concerts, comedy shows, etc. I like the whole feel of the arena and this Sunday, I was able to participate in a Dallas Mavericks game. Sidebar: I love that you can get all the professional sports in Dallas. You can watch a major baseball league game with the Texas Rangers, professional hockey with the Dallas Stars, NFL games with “America’s Team” aka the Cowboys, and NBA games with the Mavericks. You simply cannot beat the sports entertainment here in Dallas. A few months ago, I held a contest privately for previous clients. The winner was able to choose one of a few prizes and we’d celebrate from there. My winners were Chauntel and Bendita who purchased a condo last year in Dallas. 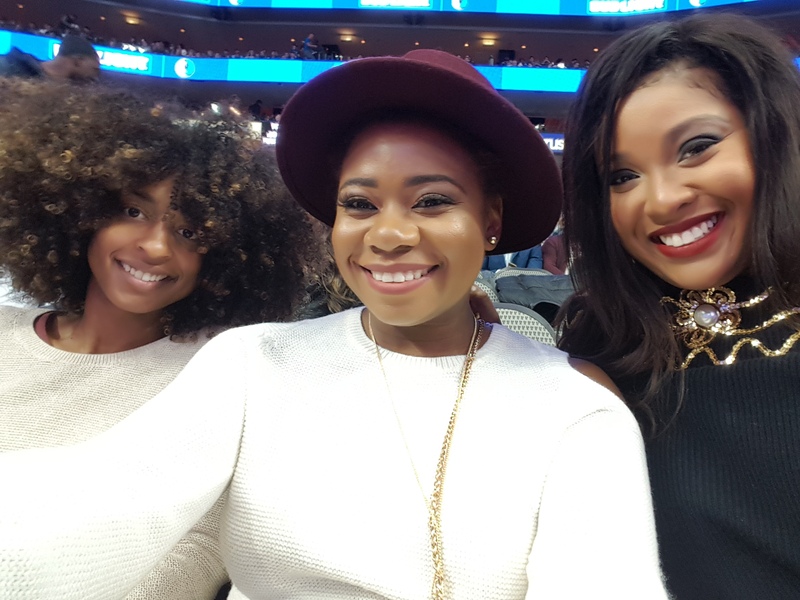 They preferred a Mavericks game which was a nice choice since I wanted to get a game in this season. As soon as our schedules matched (more so theirs because their travel game is years ahead of mine), we decided on the Mavericks versus the Kings game. The schedule changed from a night game to a daytime one so Bendita could no longer attend. My friend Blythe happily took her place. You can grab really great seats for the low at a Mavericks game. I have been really surprised on the price of tickets that I score. Earlier in the year, I scored Mavs and Thunder playoff tickets in the 100 section for less than $150. Last night, the tickets were behind the goal for $45 each. Can we say winning? 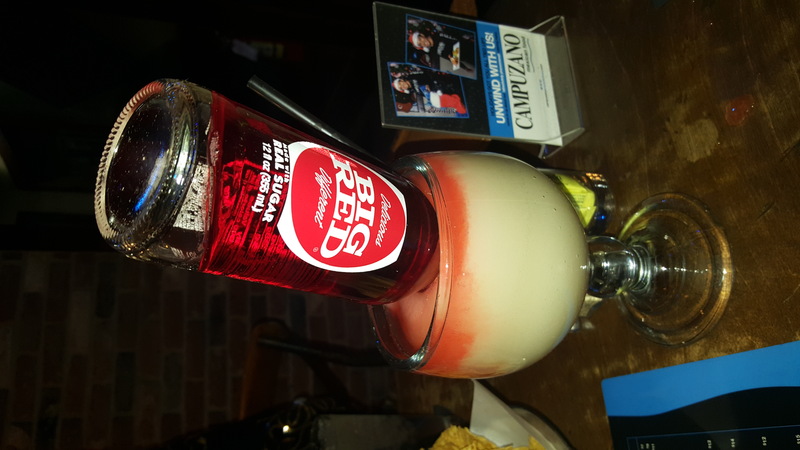 I don’t know the name of this drink but we selected this restaurant based on Yelp pictures of it. 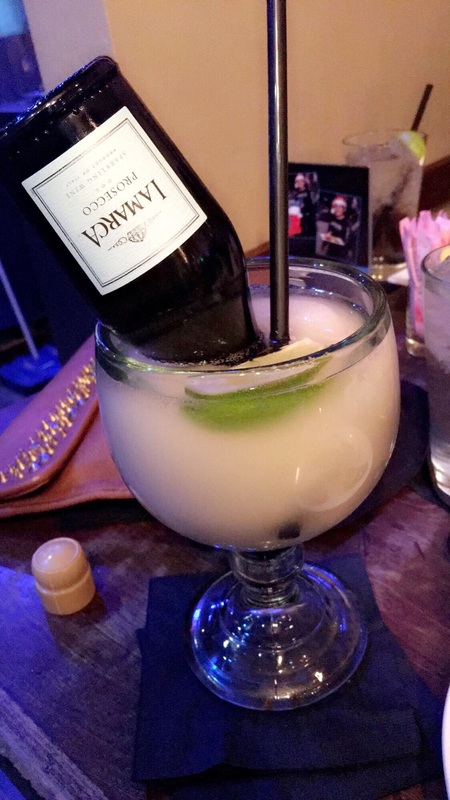 It was this drink and the shrimp nachos that won us over. 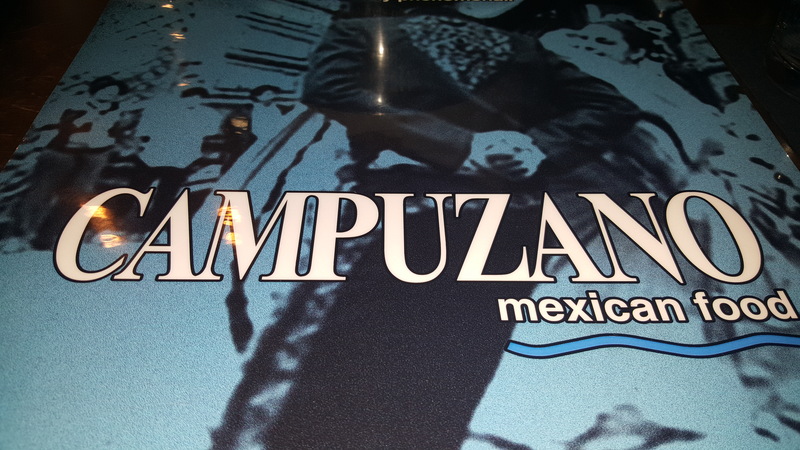 Let’s just say that it won’t be our last time going to Campuzano. Our day started at 3:15 and we spent over 5 hours just enjoying the day DESPITE the 60 degree weather drop in Dallas. I forgot yesterday was Sunday and expected to take a rest day today. I wanted brunch food but at 6pm, is it even called brunch? 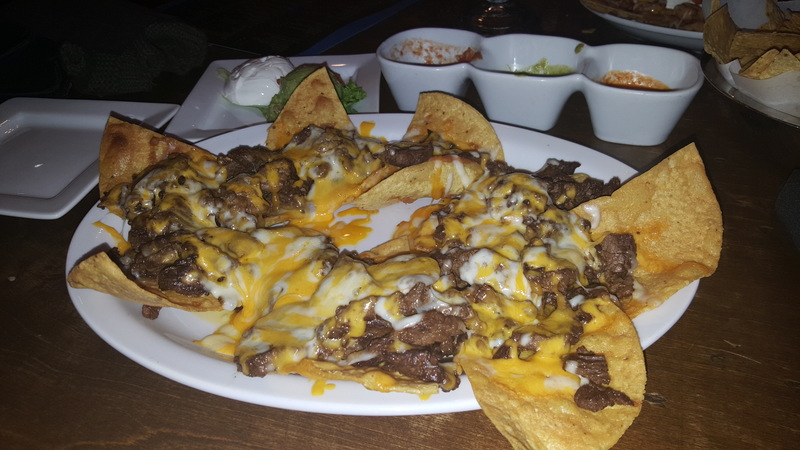 Nachos will do. What’s your favorite Sunday Funday activity in Dallas? If you follow my Instagram page, @NewAveRealty, then you will know that I always share my experience of my Dallas “happenings”. I love to get out and explore Dallas in my free time. This is usually on Sundays. I work Monday – Saturday and all I ask for is some time to myself on Sundays. That basically means to catch up with girlfriends and brunch. I’ve compiled a list of some of my favorites places. If you have a place that you’d like to mention, place it in the comments and I will hit it up. *BONUS: There is a new Instagram page called @YouPeopleReviews, that highlight a lot of places to eat around the metroplex. I’ve gotten some places from them as well. I’m a Louisiana girl so I love me some Cajun food. I am not big on Creole (there is a difference) but I love me some Cajun food. 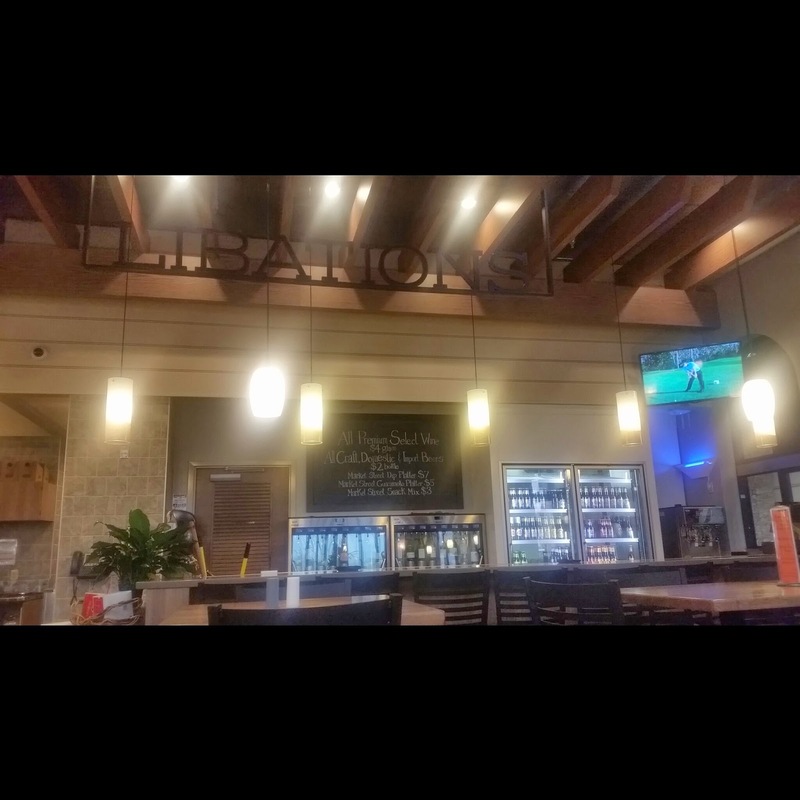 Here is my list of my top favorite cajun food spots. NOLA Grill (Frisco) – Had this last night and I must say the food was amazing. The collard greens tasted just like my Mama Elsie’s. If they don’t have anyone from Louisiana as the owner or cook, I don’t believe it to be Louisiana cooking. There is no debate about that. Now for some good down home cooking, you have to head south of the metroplex. My favorite spots to get food just how I like it is in Oak Cliff. Seriously, I will wait in line for these places. Floyd’s Catfish (Oak Cliff) – Now I am not sure if this place is still open. If it is, you’re in luck. If not, I am so sorry that you missed out. Chicago’s Chicken Coop (Carrollton) – So this one isn’t in the southern part of the metroplex. It opened up last year and I went like everyday the first week. 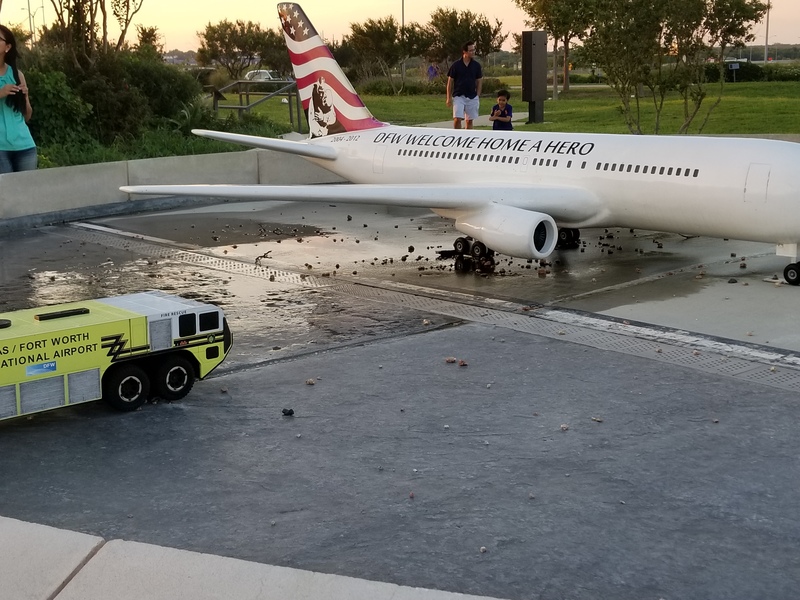 I have to admit that it was mainly for the butter cookies. Pluckers (Various Locations) – This should really have a category of its own but since I included chicken in this category I thought to place it here. There is no other wing spot that can beat Pluckers to me. 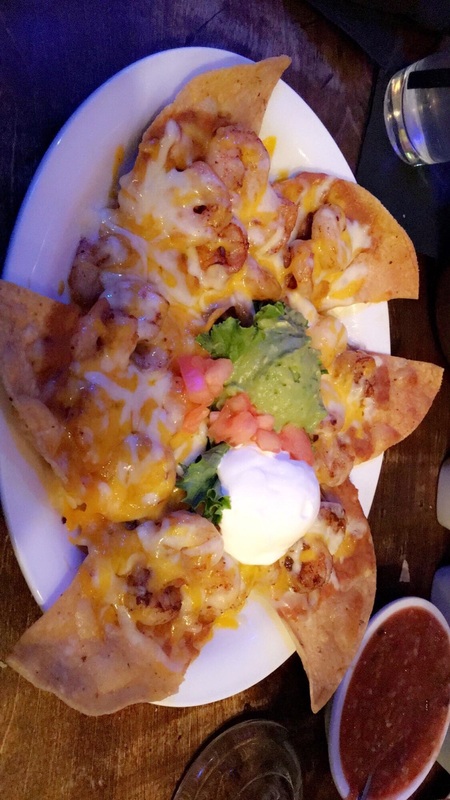 Wing Daddy (Little Elm) – this little gem in Little Elm has some fun margaritas and fried pickles are to die for. Decks in the Park (Klyde Warren Park) – This is my favorite summer time event in Dallas. It’s a perfect unwind in the park at night and just vibe along the music. This category is my all-time favorite. This is what I love to do and I will try new places often. So please send me some awesome brunch spots. 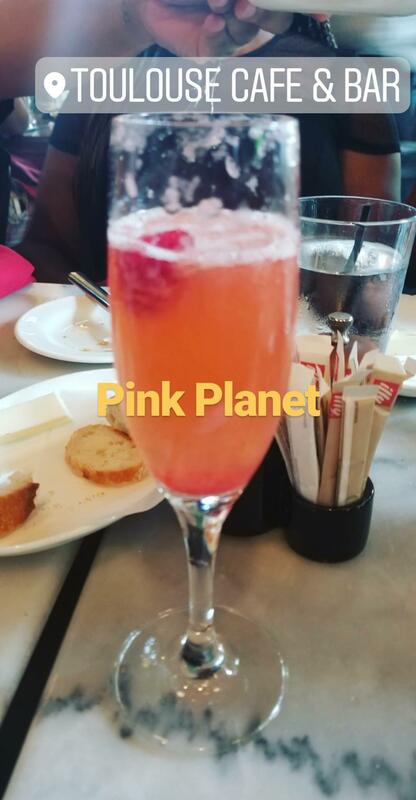 Julia Pearl (Plano) – I went here for brunch last weekend. I want to go back for dinner soon to give it another chance but it wasn’t bad at all. Public School 214 – It is all about concept to me (sometimes) and this one steals the show. It has a grade school concept with menus being on composition books and drink menus on scantrons. It is the cutest thing to me. Those are just a few of my favorite places to go. They aren’t in any order. Try them out and let me know what you think. If you ever need a recommendation on a place, contact me or just follow my Instagram. I am sure I will post it there. This weekend the parentals came into town. I thought it would be cool to bring them to some places that I like in North Texas while checking out something new to all of us. I took them to one of my favorite BBQ spots (yep, you guessed it), Rudy’s BBQ. My stepdad was amazed and in love with his jumbo loaded brisket potato (I’m sure that isn’t how it is described on the menu but that’s how I order it). Meanwhile my mom kept it simple with ribs. So before I venture out to our next journey during Easter weekend, I will first let you know about my parents. They are old-school Southern parents who stick to the norm. They don’t venture out of their comfort zone and it has been that way for 50+ years. Their off the wall daughter is tempting to change that before 60. So I knew I had to ask them to spend the day with me to get them to go to my next venture and I also had to pay. So Rudy’s was the first stop. Then as we left I proceeded to tell them that I needed some flowers to brighten my living room space and I needed them fresh. 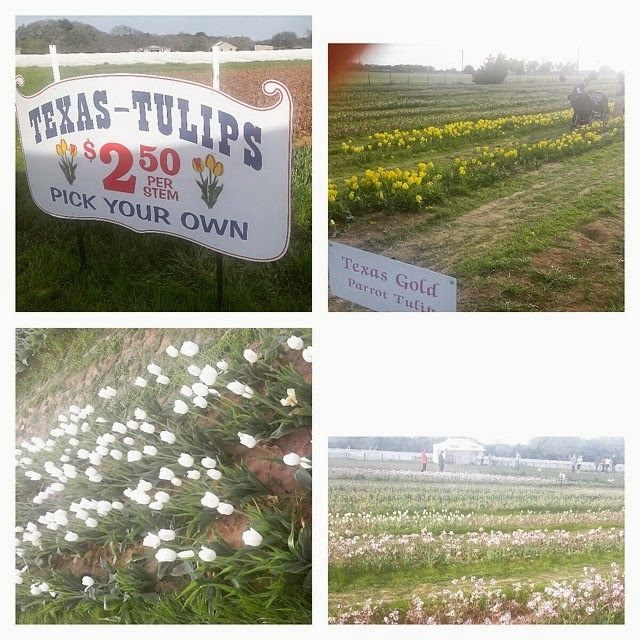 So in the midst of that explanation, we drive up the highway to Pilot Point, Texas to Texas Tulips. They were amazed at the rows of tulips that we could hand pick to fill our homes. I want to thank Fox 4 News for the advertising the weekend event because I NEVER knew there was such a thing in North Texas. I would say the first step of helping my parents try something new was a success at the tulip farm. Easter was fun and a great way to ease down the Texas highway to new ventures. I even drove them to the Oklahoma/Texas border just so they can say they have been to Oklahoma. The face my mother made when I told her to “Facebook it” was priceless. Her hands couldn’t type fast enough for her first Facebook post. All in all I cherished these moments with my parents. 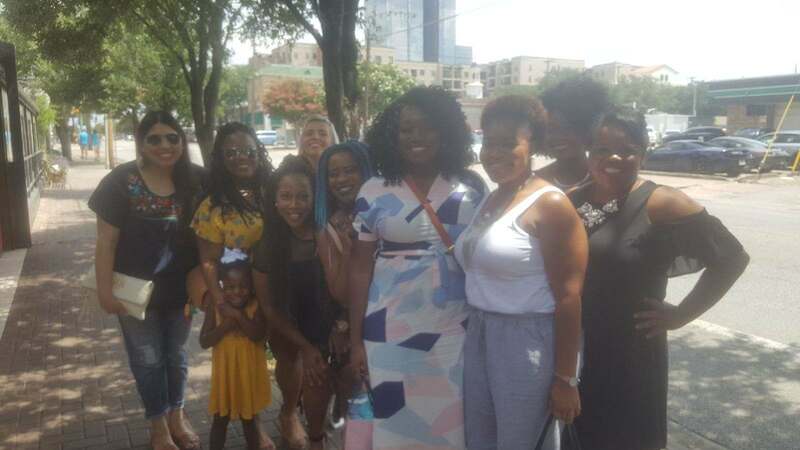 I was able to show them a new side of Texas and hopefully they will be up for the next journey as Drea Takes on Dallas. How was your Easter and what was memorable for you? This weather in the Dallas/Fort Worth has been for the birds. Last week consisted of all four seasons in 7 days (rain, sleet, snow, ice – oh the ice!) Unfortunately I missed the warmest day but I got to experience warmth as I traveled to Louisiana. My taste of shrimp and grits was halted by the weather in Dallas/Fort Worth. I decided to cut my trip short to head back to the metroplex before I was stuck in my college hometown of Baton Rouge or my actual hometown of Ruston. So when Sunday came, I was already over the weather and just needed the time to myself. I will say that Saturday I trucked my way to Paradise Cove in Southlake to see my sorority sister marry the love of her life. I think I still have a natural high of that. (P.S. I love Louisiana weddings. It is different from normal ones just more of our unique culture added to it (cajun/creole food, second line, other music)). 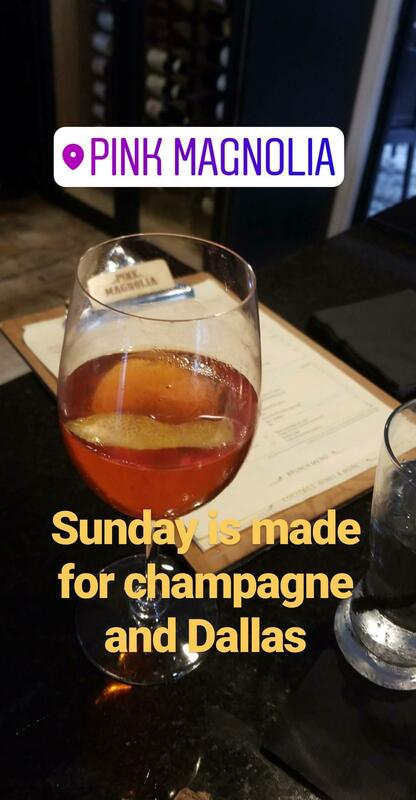 So Sunday I decided to have a personal “Sunday Funday.” Now Sundays are my days that I have off from work so I tend to do all the things I just didn’t quite make it to throughout the week like laundry, grocery shopping, and BRUNCH. I know that is a weekend thing but I absolutely love brunch on a Sunday. 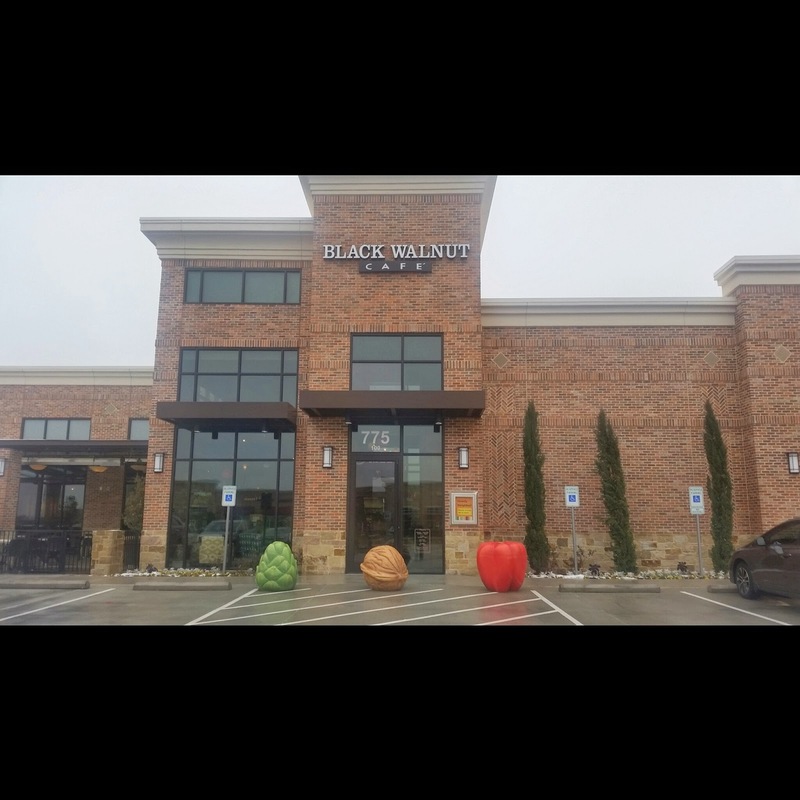 My first stop was to Coppell at Black Walnut Cafe. This has become my new all time favorite spot in Coppell. I cannot fully describe the ambiance at Black Walnut Cafe. All that I can say that if you go get the thick peppered bacon. I promise you that you will not regret it. Oh and the traditional pancakes. It is mixed with powdered sugar, butter, and has syrup on the side. My mouth is watering just thinking about it. Next I ventured over to Flower Mound. I was headed home but after a week of rain, ice, sleet, and snow, I thought my couch wouldn’t miss me so I made my next stop to Five Below. To you reading this, why didn’t you tell me about Five Below? When I walked in, I literally felt like a kid in a candy store. There snack specials for days (Disclaimer – I am a huge snacker. My favorites are Lifesaver Wild Berries gummies, rice krispy treats, cheddar cheese and sour cream Ruffles, and the list goes on). This store was like a mix of Wal-Mart and Dollar Tree. It took some time to get me out of there. My last journey was to grocery shop. I decided to go the Market Street in Flower Mound since I was already in the town. Immediately as I walked in the store, I realized that this one was nothing compared to the one in Coppell. I mean it had its similarities but this one was a little different. I tasted wine, I found Louisiana boiled shrimp (yes this made me happy since I missed out on shrimp and grits), and even tried the advertised burgers and fries. Market Street is the ONLY store that I am willing to try their “hot food.” If I miss their breakfast, I am highly upset. Now I have never known a grocery store that has a full bar inside but Market Street in Flower Mound does. I was upset that it wasn’t open when I shopped but that was the “oh wow” factor for me. How do you spend your Sunday Funday? Is it a relaxing one as mine was this past Sunday? What’s your favorite place to frequent in your neighborhood?